There are many different types of bombs which disperse ionizing radiation. 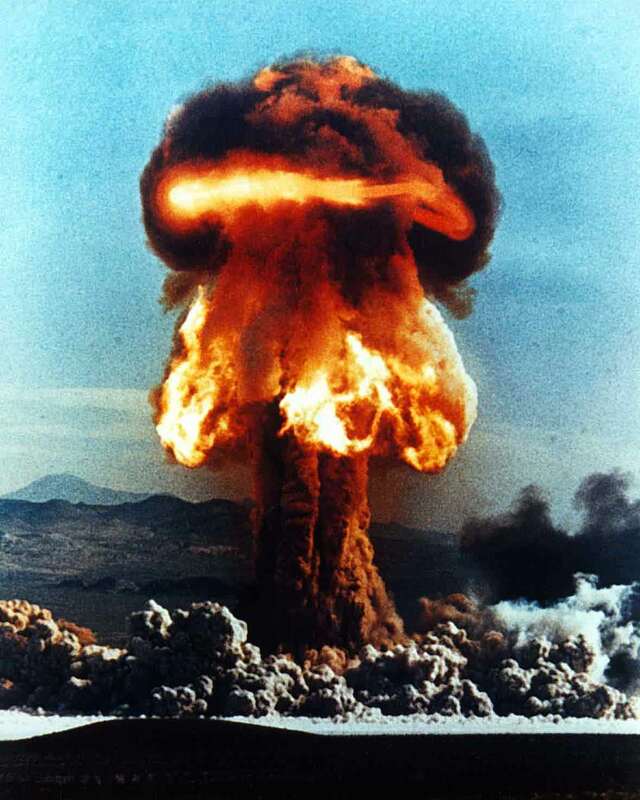 The atomic bomb, in which a fission reaction results in a high energy output and extreme and direct destruction is the type of device that first comes to mind when discussing a 'nuclear' weapon. But there is a variety of radioactive weapons, bombs which kill, perhaps less dramatically than with one huge blast, but which potentially kill with just as deadly a force and perhaps with even more suffering. These bombs are called 'dirty' and 'dirty' is all about 'fallout'. But 'fallout' usually refers to the 'residual radioactive material propelled into the upper atmosphere following a nuclear explosion', so-called because it 'falls out' of the sky after the explosion and energy pulse of the blast have passed. This radioactive dust and ash may also originate from a damaged nuclear plant. The radioactive dust consists of material either directly vaporized by a nuclear blast or charged by exposure and, whatever the source, results in contamination of soil and water supplies, possible leading to devastation of the exposed environment that lasts years after the event. 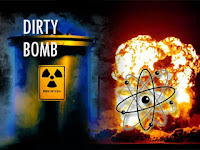 With a dirty bomb, there is no true 'falling out' of dust from the sky but, in effect, the same result occurs in perhaps a more restricted area and possibly with more severe localized levels of radiation exposure. The main difference between a nuclear blast and a dirty bomb is not necessarily the ultimate degree of radioactive damage inflicted but the fact that a dirty bomb is easier to make, easier to conceal, easier to transport and easier to detonate. 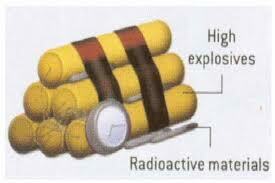 A dirty bomb combines radioactive material (which can be obtained readily from multiple sources) with conventional explosives. The purpose of the weapon is to contaminate the area around the explosion site with radioactive material, hence the term 'dirty'. The dirty bomb is essentially a 'radiological dispersal device' (RDD). The explosion itself, using conventional explosives (dynamite) would likely have lethal effects, at least locally. Studies suggest that not enough radiation could be dispersed in high enough concentrations to cause severe illness or death. A test explosion of a 'dirty bomb' and subsequent calculations done by the United States Department of Energy found that even if nothing is done to clean up the affected area and everyone stays in the affected area for one year, the radiation exposure would be high but not fatal. Analysis of the fallout from the Chernobyl disaster (see post: Man-Made and Natural Nuclear Disasters) shows that the effect on many people in the surrounding area, (although not those in close proximity) was extremely low. So is a dirty bomb a weapon of mass destruction or rather a weapon of mass terror? Certainly as a source of terror, a dirty bomb would be effective. The device would be high-profile (any blast would be noticed and investigated) but not insidious or stealthy as other terrorist techniques could be (see post: The Terrorist With a Demon Core). But, in the case of a dirty bomb, time and money would be needed to address the contamination problem and there would always be the uncertainty of what the longer term future held for the people exposed. And what if multiple bombs were detonated in close proximity to one another, at or near the same time? Many devices could essentially create a true fallout effect, increasing the number of people exposed as well as possibly increasing the degree of their exposure. As of 2012, a dirty bomb is only a speculative radiological weapon in that no such device has ever been successfully deployed (yet). But since the attacks on the World Trade Center in New York City in September 2001, the fear that terrorist groups could use dirty bombs has increased significantly. There have been a few cases of threatened dirty bombs. On two occasions, caesium-containing devices were found, neither of which was detonated. 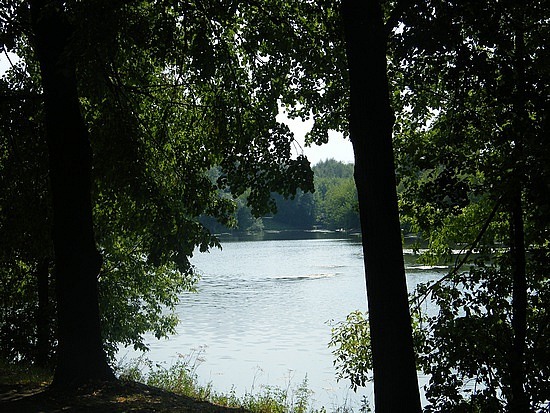 The first attempt of radiological terror was carried out in November 1995 by a group of Chechen separatists, who buried a mass of caesium-137, wrapped in explosives at the Izmaylovsky Park in Moscow. A Chechen rebel leader alerted the media, the bomb was never activated. 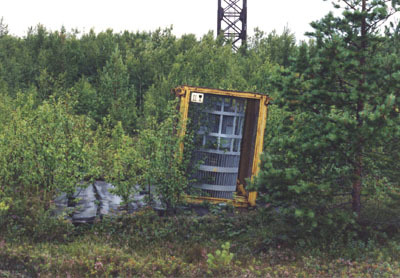 In December 1998, the Chechen Security Service, discovered a container filled with radioactive materials (caesium, once again) attached to an explosive mine, hidden near a railway line in the suburban area Argun, ten miles east of the Chechen capital of Grozny. In August, 2008, a large Iranian cargo ship, the MV Iran Deyanet was hijacked by Somali pirates. American government sources largely ignored the event but the hijacking became headline news in Russia. 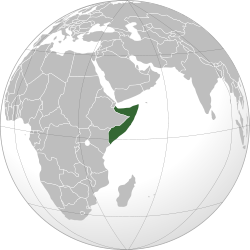 In the 21st century, Somalia, with its 1800 miles of coastline has become an international terrorist haven as well as a safe haven for pirates plying their trade as far away as the coast of India. On August 2, it was reported that three vessels, one Iranian, one Japanese and one German, along with 57 crew members were hijacked by pirates in the Gulf of Aden, the stretch of water connecting the Red Sea and the Indian Ocean near Somalia. The MV Iran Devant had departed Nanjing, China on July 28 and was headed to Rotterdam to deliver 42,500 tons of iron ore and other 'industrial products' to an unidentified German client. 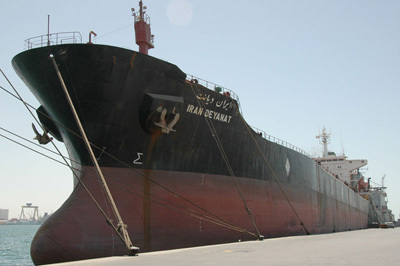 The Iranian bulk carrier and its 29 crew members, belonged to the Islamic Republic of Iran Shipping Lines (IRISL), run by the Iranian Revolutionary Guard. Forty Somali pirates, armed with AK-47s and rocket-propelled grenades brought the MV Iran Deyanet to Eyl, a fishing village in northeastern Somalia where a larger contingent of pirates took control of the vessel – 50 on board and 50 patrolling on the beach. Attempts to inspect the ship's seven cargo containers failed, the pirates unable to break into the holds and the crew swearing they did not have access codes to the locks. The captain and engineer of the ship at first said the containers held crude oil then changed the story to say there were 'minerals' in the holds. After several efforts, the pirates succeeded in opening one of the containers and discovered packets of what was described as a 'powdery fine sandy soil'. Those exposed to the powder became sick and within days began to exhibit symptoms which looked like skin burns as well as hair loss. Sixteen of the pirates died. According to Russian reports, the entire cargo was radioactive sand obtained by Iran from China in exchange for oil then sealed in containers. The plan had involved detonation of charges on the ship after the crew had escaped in life boats. The planned blast would have been taken high into the air where prevailing winds would then have pushed the highly dangerous and radioactive cloud ashore. The MV Iran Deyanet was, in effect, a huge floating dirty bomb, intended to detonate after exiting the Suez Canal at the eastern end of the Mediterranean and in proximity to the coastal cities of Israel. Because a dirty bomb has never been successfully used, there is disagreement as to how deadly or destructive the device would actually be. Many studies have suggested that a radiological dispersal device such as a dirty bomb would not physically harm nor kill many people. But one thing is certain. The detonation of a dirty bomb would have tremendous psychological impact as well as economic impact on the target population and country. But there have been 'accidental' dirty bombs - radiological accidents really, which spread radioactivity in a manner similar to that of a radiological dispersal device. One example is the accident which took place in Goiania, Brazil between September 1987 and March 1988. On September 13, 1987, two metal scavengers broke into the radiotherapy clinic of an abandoned city hospital and removed a radiotherapy source capsule containing powdered caesium-137 with a radioactivity of 50 T Bq. The two men took the component home and began to take it apart with the plan to sell it for scrap metal. Later that day both men began to show signs of radiation illness with vomiting, swollen hands and diarrhea. 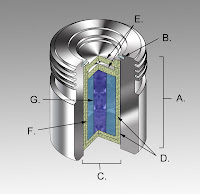 Work on the container continued and within a few days, one of the men punctured the 1 mm thick window of the capsule, allowing caesium chloride powder to leak out. The powder glowed blue in the dark and the man brought the container and powder back home to his family and friends to show them this curiosity. Within 2 weeks, spread by contact, contamination caused an increasing number of people to fall ill. Before the correct diagnosis of acute radiation sickness was made, 249 people had been contaminated, 151 of whom showed signs of both external (ex skin burns) and internal (vomiting, anemia). Twenty people became seriously ill and 5 people died. The cleanup operation necessitated topsoil removal from several sites and the demolition of several homes. All the objects from within those houses were removed and examined. 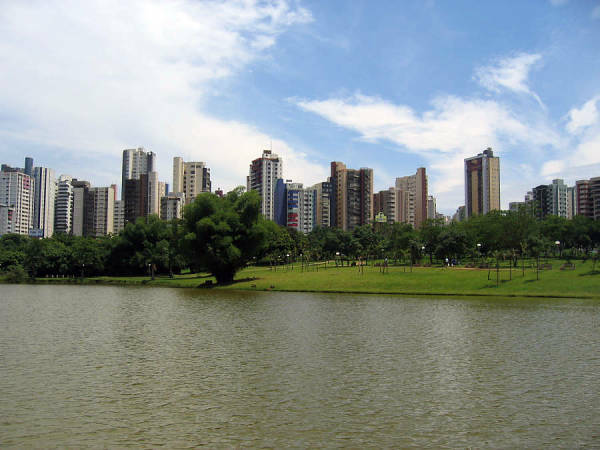 The Goiânia incident to some extent demonstrates a possible contamination pattern of radioactive dispersal, even without an explosive device. The incident also shows how fatal even very small amounts of ingested radioactive powder can be and raises concerns of how effective a 'dirty' device can be if a powdered alpha-emitting material (such as polonium-210; see post: Radiation to Cure, Radiation to Kill) is used. 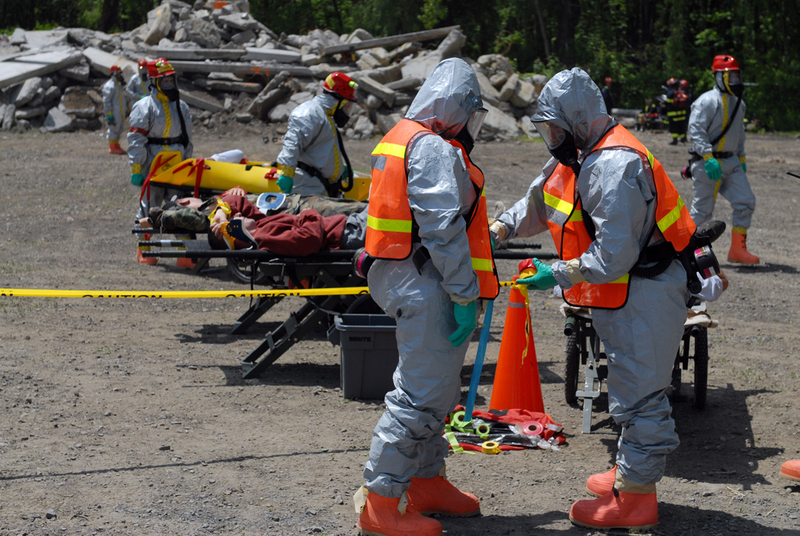 Although no dirty bomb has been detonated to date, it is well-known that terrorist groups are actively pursuing unsecured radiological material, and several of them may already possess dirty-bomb capabilities. Significant amounts of radioactive materials are stored in laboratories, food irradiation plants, oil drilling facilities, medical centers, and many other sites throughout the world. Cobalt-60 and caesium-137 are used in food disinfection, medical equipment sterilization, and cancer treatments. 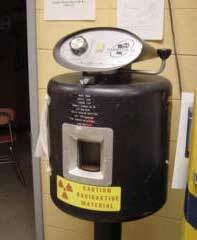 In the USA, nearly 1500 pieces of radioactive material went 'missing' between October 1996 and September 2001. The vast majority of the missing items contain tiny amounts of radioactive material and pose little threat but there have been several instances where hospital equipment has been lost or stolen, equipment that contains potentially lethal amounts of radioactive cobalt or cesium. The threat of a dirty bomb has been taken seriously by the US government. From June 5 to June 7, 2009, 400 New York Army and Air National Guardsmen as well as volunteers from the New York State Guard converged on Albany to practise their skills in responding to a dirty bomb attack on an American city. The three-day exercise involved the theoretical detonation of a high explosive device covered with radioactive material outside the New York State Capital, covering downtown Albany with radioactive contamination and forcing thousands of residents to shelter indoors for two days. Scenarios have been worked out as to explosion and wind distribution of radioactive materials from a dirty bomb. 1. Inhalation of radioactive dust by the population directly exposed to the radiation cloud. Particles containing cobalt or caesium will stay in the body and result in long term exposure. 2. Exposure to settled dust after the radioactive cloud has passed. Caesium or cobalt-containing ground dust (gamma particles) results in on-going exposure for residents; dust containing americium (alpha particles) may be whipped into the air again by traffic or wind and inhaled resulting in internal radiation exposure. 3. Contaminated food and water especially in rural areas where water collection regions may be vast and monitoring more difficult. Dust clouds from nuclear accidents (similar to a dirty bomb) have been seen. Following the Fukishima accident in 2011, scientists performed testing which showed nuclear radiation raining down on Tokyo from incinerators that were burning radioactive sludge and other materials contaminated with radiation from the damaged nuclear plant in Fukishima 65 kilometers away. In the United States, aside from radioactive devices used in medicine and industry, there is at least one other potential source of radioactive material that may be useful to build a dirty bomb. The Gammator was a gamma irradiator made by the Radiation Machinery Corporation during the U.S. Atoms for Peace project of the 1950s and 1960s (see post: Nuclear Waste). The Gammator was distributed by the Atomic Energy Commission to schools, hospitals, and private firms to promote 'nuclear understanding'. About 120-140 Gammators were distributed throughout the U.S. and the whereabouts of several of them remain unknown. The Gammator weighed about 1,850 pounds and contained caesium-137 in a pen-sized pellet (400 curies of radioactivity). The device was well-shielded and safe when used as intended (school science experiments) but the amount of nuclear material was large enough to cause significant problems if used as the radioactive component in a dirty bomb. Between 120 and 140 Gammators were distributed to schools across the country. Since the attacks of September 11, 2001, the US Department of Energy has been trying to retrieve these devices. In 2004, Massachusetts Congressman Edward Markey claimed that six Gammators had 'gone missing'. So, how do you build a dirty bomb? 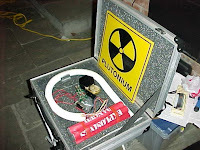 A terrorist organization (or even a disaffected former employee) must first obtain radioactive material by stealing it or buying it (legally or illegally). Radioactive material could come from the millions of radioactive sources used worldwide in industry, for medical purposes (Goiania, Brazil is a good example) and in research institutions. Few of these sources provide the isotopes (caesium-137, cobalt-60, americium-241, californium-252, iridium-192, plutonium-238, polonium-210 (see post: Radiation to Cure, Radiation to Kill), radium-226, strontium-90) which would be useful for this type of terrorist weapon. It has estimated that within the U.S., approximately one source of these isotopes are lost, abandoned or stolen every day of the year. Within the countries of the European Union, the annual estimate is 70. There exist thousands of such lost or abandoned sources scattered throughout the world. There are also thousands of 'orphaned' sources in Russia, lost following the collapse of the Soviet Union. Especially worrisome are the Russian strong beta-emitting strontium-90 sources used as radioisotope thermo-electric generators used in beacons in lighthouses in remote areas. In December 2001, three woodcutters in Georgia (former republic of the Soviet Union) found one such power generator and dragged it back to their camp site to use it as a heat source. Within hours they suffered from acute radiation sickness and required hospitalization. The generator contained approximately 40 kilocuries of strontium,equivalent to the amount of radiation released immediately after the Chernobyl accident (see post: Man-Made and Natural Nuclear Disasters). There have been several incidents of alleged intent to make and detonate a dirty bomb. 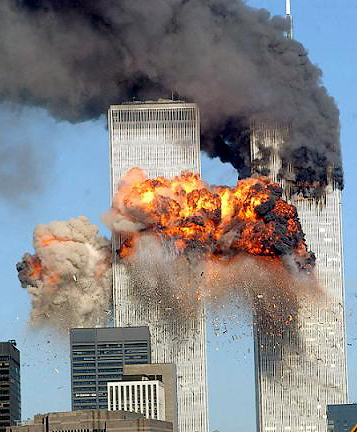 many of these cases are linked to Al-Qaeda since the airline bombing of the Twin Towers in New York City in 2001. 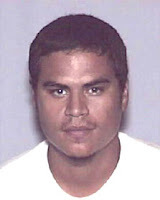 On 8 May 2002, Jose Padilla (a.k.a. Abdulla al-Muhajir) was arrested on suspicion that he was an Al-Qaeda terrorist planning to detonate a dirty bomb in the US. Padilla had not obtained radioactive material or explosives at the time of arrest but authorities did uncover evidence that he was on reconnaissance for usable radioactive material and possible locations for detonation. Later, the charges against José Padilla were dropped. 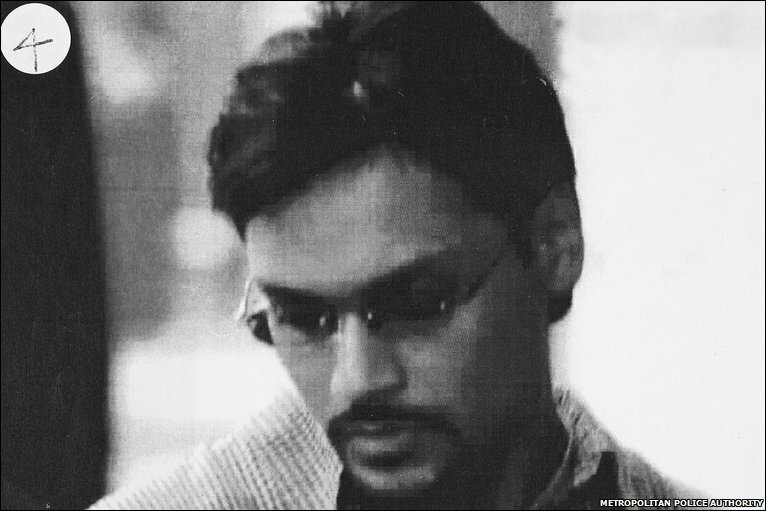 In 2006, Dhiren Barot of North London pleaded guilty of conspiring to murder innocent people in both the United Kingdom and the USA. using a dirty bomb. He had planned to target underground parking lots in British and American cities. Experts say if the plot to use the dirty bomb had been carried out it would have been 'unlikely to cause deaths, but was designed to affect about 500 people'. 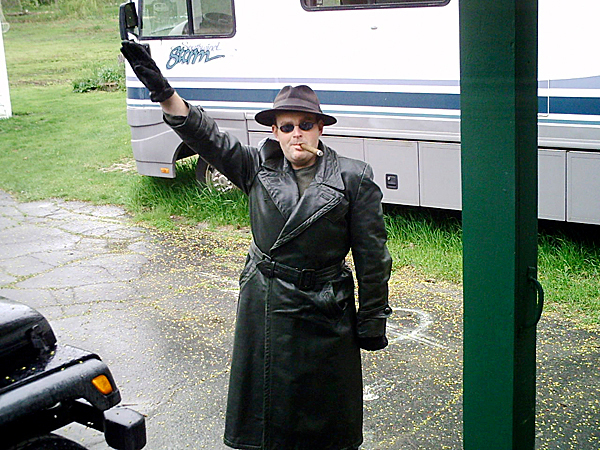 In January 2009, an FBI report described the results of a search of the Belfast, Maine home of white supremacist, James G. Cummings, who had been shot and killed by his wife. Investigators found four one-gallon containers of 35 percent hydrogen peroxide, uranium, thorium, lithium metal, aluminum powder, beryllium, boron, black iron oxide and magnesium as well as literature on how to build dirty bombs and information about cesium-137, strontium-90 and cobalt-60, radioactive materials. In April 2009, the Security Service of Ukraine arrested a legislator and two businessmen from the Ternopil Oblast region. 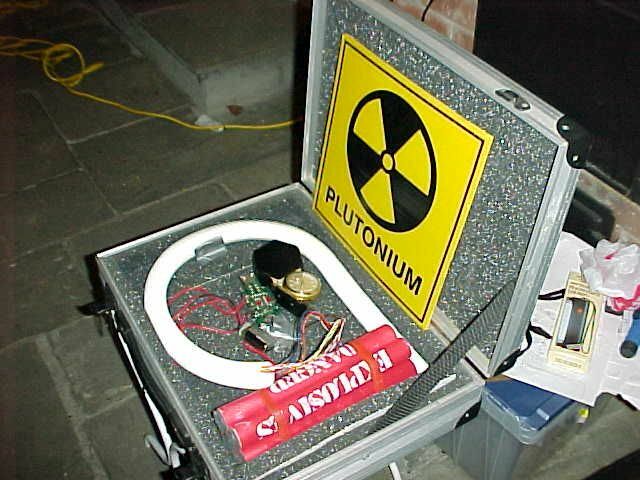 The security service seized in the undercover 3.7 kilograms of what was claimed by the suspects during the sale as plutonium-239, used mostly in nuclear reactors and nuclear weapons, but was determined by experts to likely be americium, a radioactive material commonly used in amounts of less than 1 milligram in smoke detectors but which can also be used in a dirty bomb. The suspects reportedly wanted 10 million US dollars for the material, which had been produced in Russia and smuggled into Ukraine through a neighboring country. To make a dirty bomb, therefore, would not be easy but certainly easier than building an atomic bomb. A dirty bomb would require a radioactive source that was 'sufficiently' radioactive to create direct radiological damage at the explosion or at least to perform societal damage or disruption (a Russian thermo-electric generator would work). The device would need to be be transportable with enough shielding to protect the carrier, but not so much that it will be too heavy to manoeuver (strontium-90 in the back pack of a suicide 'bomber' would work). 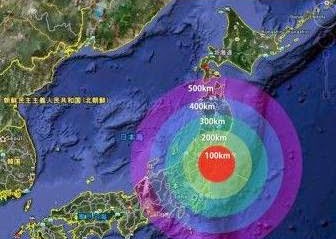 Finally, the source would need to be sufficiently dispersible to effectively contaminate the area around the explosion ('powdered' strontium-90 or caesium-137 has already been shown to be effective). 2. transport the radioactive material to the target site (in a sealed and protected box or trunk); 3. pack the radioactive material around a detonation source (simple dynamite will do). And what do you do if (or when) a dirty bomb is detonated nearby? Get out of the way of the dispersal cloud. Move across or up wind to escape the area. If in a house or car, stay inside, turn off the air conditioning and heat and close the windows. If near the blast, take cover inside in a lower inside room away from doors and windows. Use a filter mask or breathe through clothing and avoid breathing through a jacket which may be contaminated with radioactive dust. Click on the link below for a PBS video on dirty bombs.